So how are you liking the every two week challenges?? I'm getting use to it. 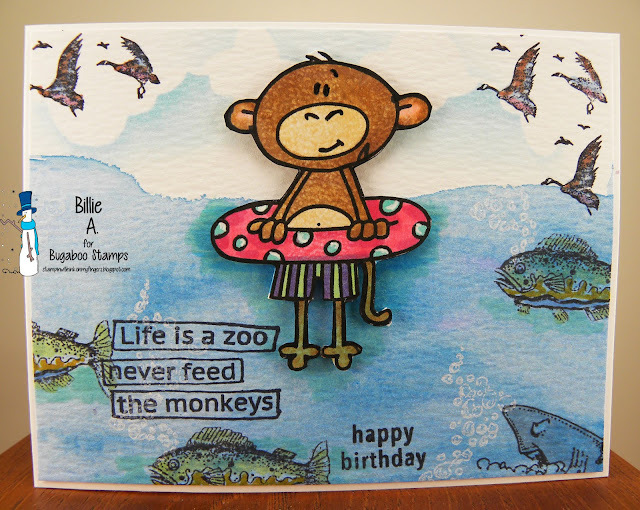 This is my card using the images and dies from My Favorite Things.. I am loving these images where you create a scene. Wouldn't they be a fun pet two own? They look so cuddly. Funny when I made the top of the card and went to adhere it to the card base.. I did it upside down.. I was looking at the images being right side up.. forgetting they are sloths and they are supposed to be upside down.... So had to carefully take it off and turn it around.. LOL I did my cloud template using Ranger inks for the background and then added the frame. I colored the images with copics. 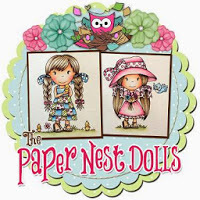 This is my card using the image called Fashion Girlz.. by Bugaboo.. I found this awesome paper called Dilly Dally and thought it brought out a lot of the colors in the challenge and I also colored her outfit with some of the colors. I used a Simon Says die and sentiment. I again used the white pen to add some details and colored her with copics. 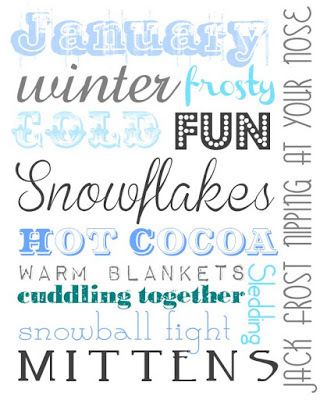 Please look at the Design Teams use of this cute image..
With Valentines day just around the corner.. I decided to use the Free-B called Rag Monkey and a card/tag? 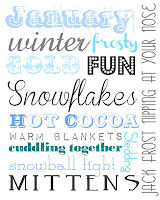 from my Simon Says kit of the month.. and make a love /Valentines card.. Maybe this will be for my hubby.. Valentine's day is our anniversary.. do I hear an awwwh? Yup it will be 35 years.. l have known him since 64 but we went separate ways and married others.. only to find us divorced later in life.. we hook up again. rest is history.. Now on to the card.. I used Ranger inks and colored the background and added the water spots.. I always love the look this gives and hated covering so much of it up with the card tag.. but you can still see the effect. I colored a piece of card stock with copics (the blue butterfly area) and an over all stamp and then adhered it behind the butterfly window. I colored the Rag monkey with copics and added a white gel pen to the dress. I wasn't sure if the blue top of her head was a scarf/hat or hair/head.. so to me it's a little scarf and bow.. 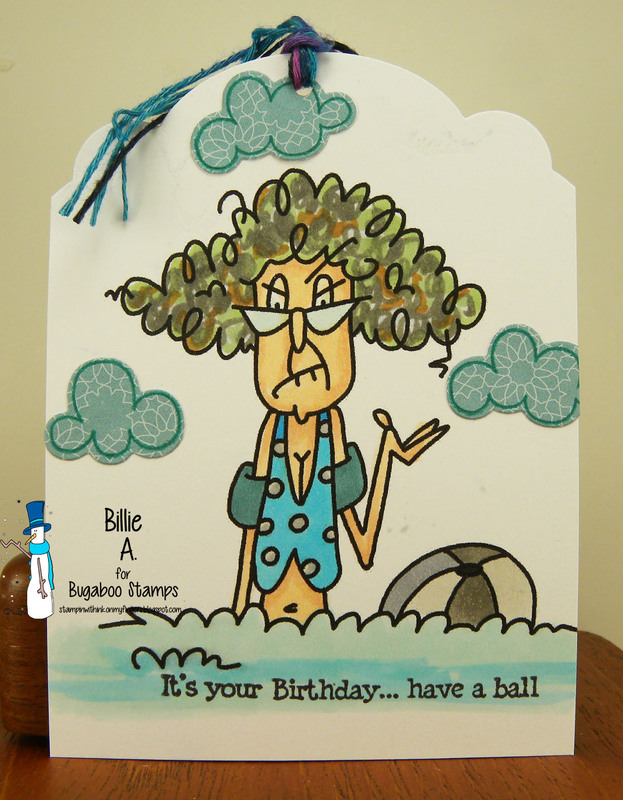 I added some sequins to complete the card. It's time to dig out those masculine images, papers, sentiments... and get a start on those masculine cards. I'm always in need of masculine cards so was happy to be able to start off the year with one. Day 7 of Catch the bug Birthday Bash.. 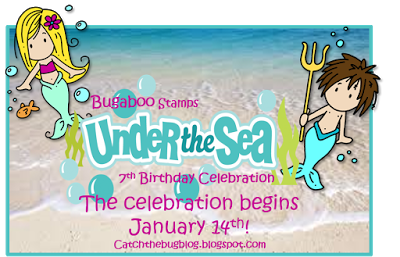 UNDER THE SEA theme..
Bugaboo called Make it snappy birthday fishes.. I colored the image with copics and then added some white gel pen dots. 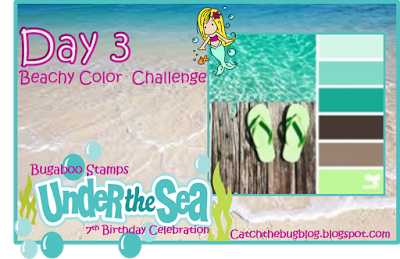 I found some fun papers and spayed the background with various colors and went around the outer embossed the turquoise paper. I sprayed the background with different sprays till I got the effect i wanted and went around the edges with Quick Quote chalk ink. I did glossy accents on the snow bubbles and eyes.. For the Recipe 2 bows.. 3 layers and 4 pearls.. I used a branch die I have from Simon says and it has the option of hanging presents or other items off of it.. I cut off the bows till I only had two.. then I hug pearls off of them and below added another branch and pearl.. I thought the branches looked like coral.. It was kind a hard to add bows to this kind of image but I think I got it to work.. Of course the 3 layers are easy.. Have fun and follow the recipe.. curious to see what you come up with. 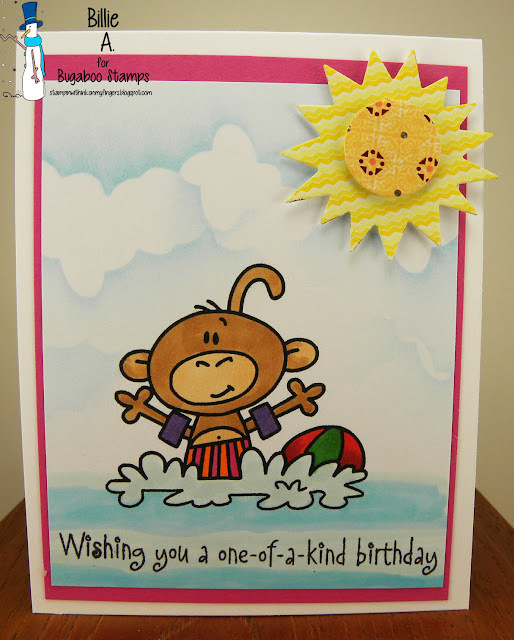 This is my fun birthday card for a child using OLDIE BUT GOODIE Bugaboo image called Beach Monkey Swim I used this image and colored him with copics and used my cloud template and the sun die is from My Favorite Thing. 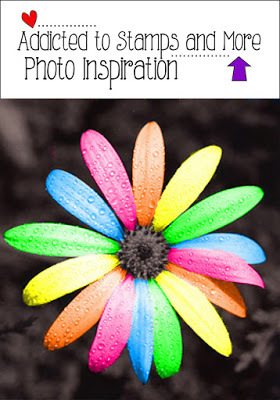 I love the bright happy colors. The sentiment is from Hero Arts. 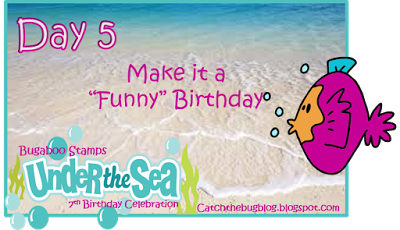 Day 5 of our Catch the bug birthday bash.. I am using the Bugaboo image called Beach monkey inner tube I took some water color paper and my Kuretake Gansai Tambi paints and did the water. I then used my cloud template to give a little blue to the sky.. I chose some fun fish from Hampton stamps, Rubber baby buggy bumper. The ducks are from Stampscapes. I had to add the shark LOL.. The sentiment is Dylusions and Hero Arts happy birthday.. It should say don't feed the sharks.. LOL The monkey is floating in the sea and the bottom half of his body has a blue tinge to it to show he's in the water. I hope the computer picks up the colors. I colored the fish with some copics.. To me it's a funny sentiment funny card.. I hope you play along.. 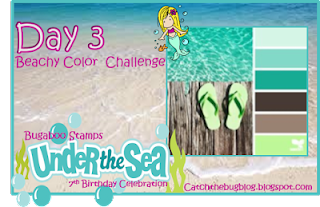 I have loved seeing the cards already entered in our other challenges this Birthday Bash week. 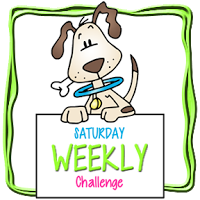 Were back with another two week challenge.. 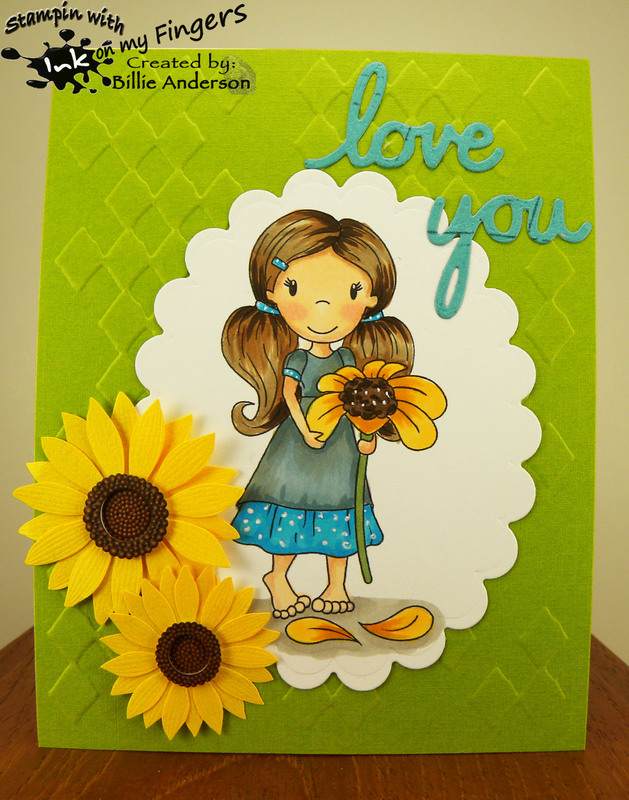 This is my card using the image Daisy Emma.. I colored her with copics. I added a little white gel pen to the dress and hair bands. 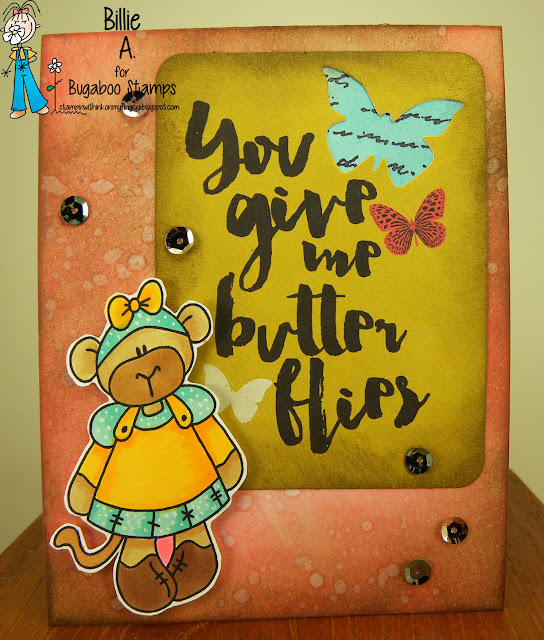 I used a Spellbinder scallop die and Tech. Tuesday love you die.. He loves me he loves me not.. LOL. 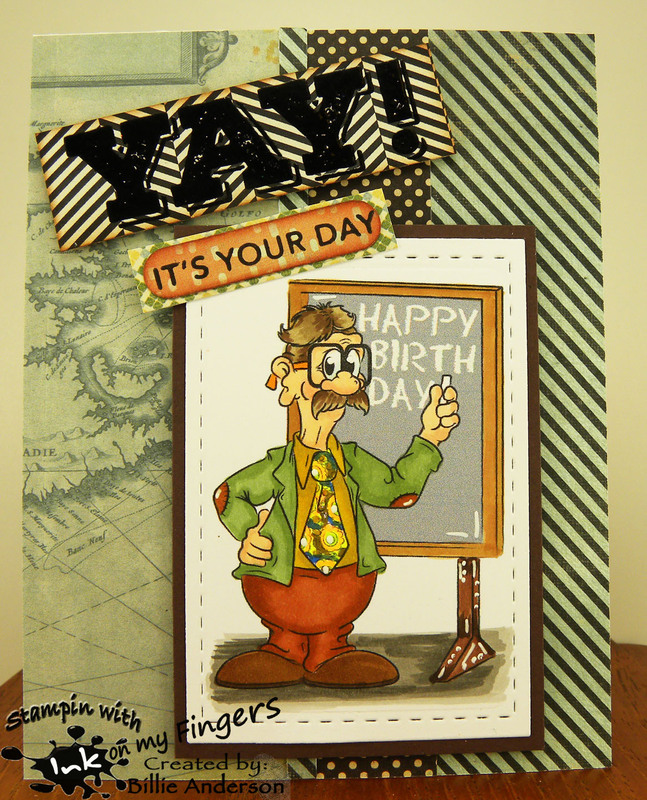 The green background I used an embossing folder. To finish off the card I used some Martha Stewart Daisies.. 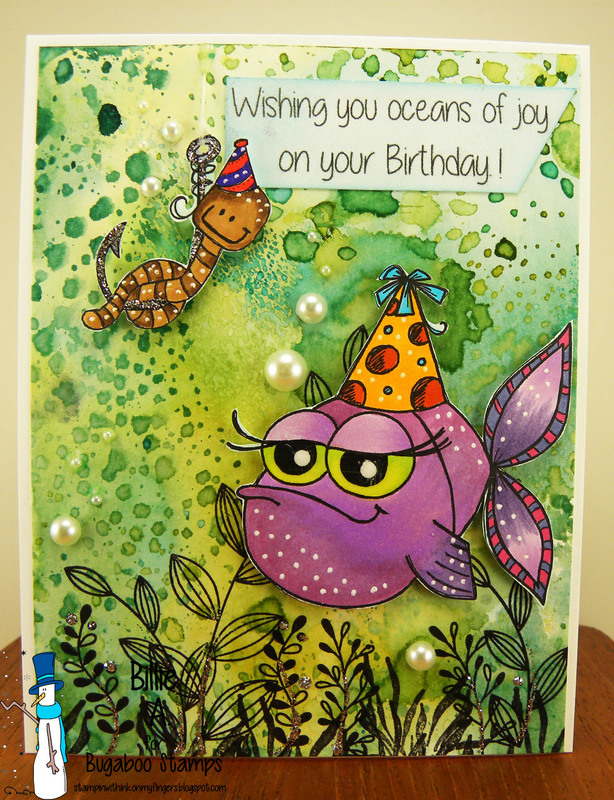 I am using the Birthday Bash release image.. there are a few images in the set and I chose to use the Birthday Fish and Birthday Worm.. I used my Ranger inks and watercolor paper to get the effect I wanted for the water background. I colored the images with copics and then fussy cut out the images. I chose the three in a row that are diagonal.. Sparkle (the fish hook and stems of the plants) Bugaboo image and Pearls. I added the pearls along the fish and worm like Jodie did the bubbles in her drawing. I grabbed some leaf stamps from Simon says and one from Rubber seed and stamped along the bottom. 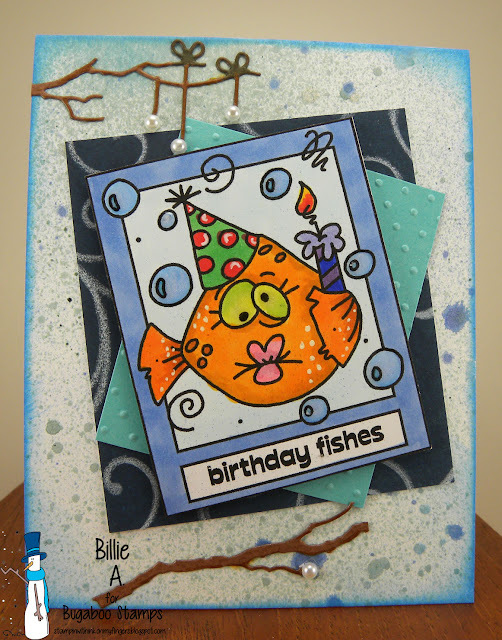 I used my white gel pen to add dots to the images and glossy accents to the eyes of the fish. The sentiment is from the Bugaboo set. I am loving this card. Day 3 of Catch the bug birthday bash. 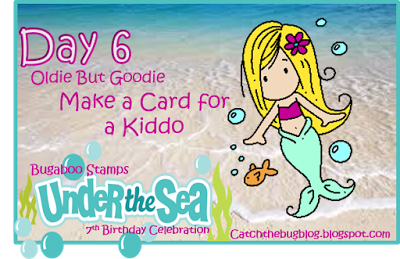 Our theme for our birthday bash is "UNDER THE SEA"
Being Monday.. at Catch the bug.. it's Anything But a Card.. I chose the image called Stella drown your troubles which you can find at the Bugaboo store.. I found this fun image of Stella and decided I would make a tag. 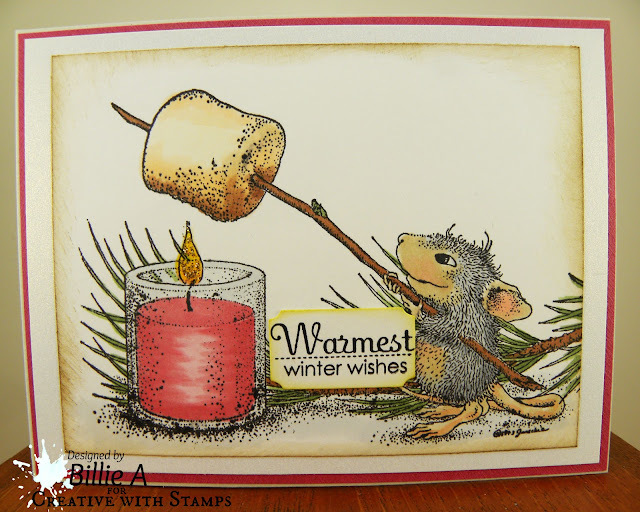 I used a Stampin up die and just cut the top edge. I added some yarns I have to the hole I punched and colored her in copics trying to keep with the color challenge. See her green hair?? She' one hip lady... I added clouds that are a die and stamp from My Favorite Things. She looks like she's having a great in the water. I love looking at the ocean and we only live about 45 min. away.. would be closer if we didn't have so many winding roads to get there. OH the sentiment is from Art Impressions.. the ones with the bowling image.. this sentiment went perfect for this tag.. It's mid month and you still have time to enter your card if you haven't done 3 already.. 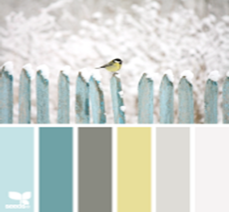 The theme is Winter Wonderland and Color challenge..
OH MY I LOVE the house mouse images and I only have two.. darn I need more. I have this one and then one with the mouse and hearts.. 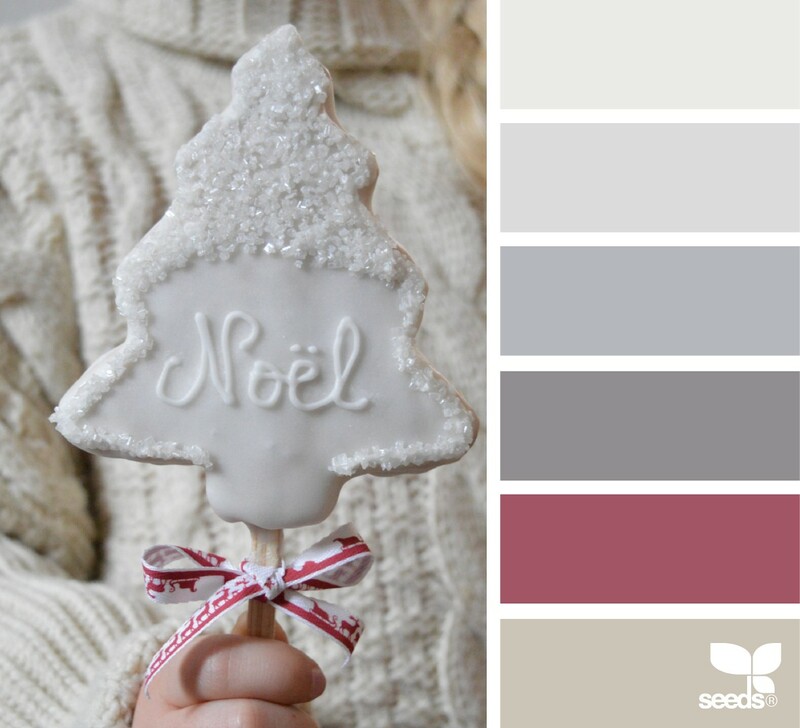 I tried to stay with the color theme.. 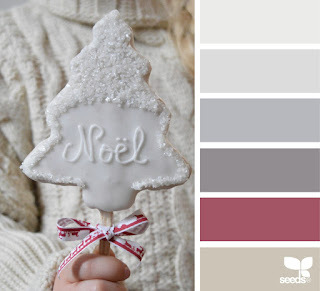 I mentioned on January 1st the colors looked more gray and the last color was a tanish color.. The printer or computer did not not talk to each other re the colors.. LOL.. anyhow I colored the image in copics and used some stickles on the flame. The sentiment is from Papertrey ink.. Kept the card pretty simple.. OH I got to use a larger piece of my 100 sheet by mistake purchase behind the image. LOL. I hope you get time to play along. 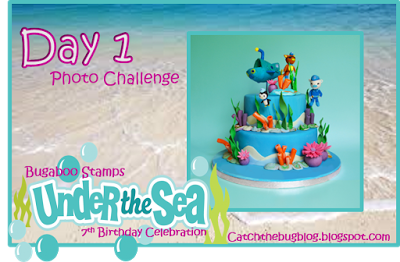 Just make sure you follow the rules.. no more than 3 cards, use stamps or digi's and add the challenge graphic. Have fun.. 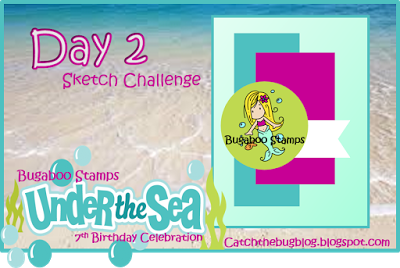 It's day 2 of the birthday bash at Catch the bug..
Our theme for our Birthday bash is "UNDER THE SEA"
Today we have a SKETCH to follow.. I am using the image called Summer Duck which you can find at the Bugaboo store.. I used a strip of blue DCWV designer paper and then ran some silver paper through my embossing folder. I used a Rubber baby buggy bumper stamp which looks like sand or water.. depends which way you use it.. that is on the banner strip. I colored the image with Copics and used some glossy accents on the mask area. The sentiment is from Hero Arts.. I added some blue gems to represent bubbles and it's completed.. oh I used the circle die from MFT. Our theme this year is "Under the sea"
The theme for today is the photo.. 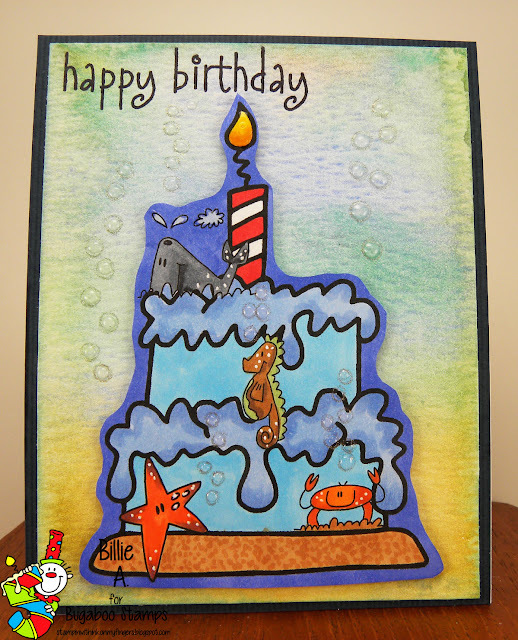 I chose the image called Birthday Cake and the little sea critters are from a set called Under the sea.. All can be found at the Bugaboo store I added the cute little critters to the cake and colored the piece with copics.. The background is watercolor paper and my Kuretake Gansai Tambi paints. I wanted a simple under the sea look.. I was thinking of making it darker but then I didn't want to make the cake much lighter so went with background light and cake darker.. I colored the candle so it was kinda like a light house..LOL. I added some white dots to the images and glossy accent bubbles. The sentiment is from Hero arts. 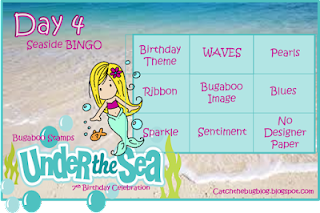 I hope you are able to play along and join our birthday party.. Welcome to Catch the bug Free Friday.. Tomorrow starts our one week BIRTHDAY BASH and the theme is UNDER THE SEA.. 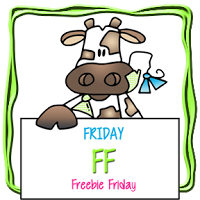 So this is the perfect Free Friday image to start the week long challenge.. so grab this awesome freeby and get started with the fun.. I printed out three of these fun Seahorse and colored them. I added them to my watercolored background paper. 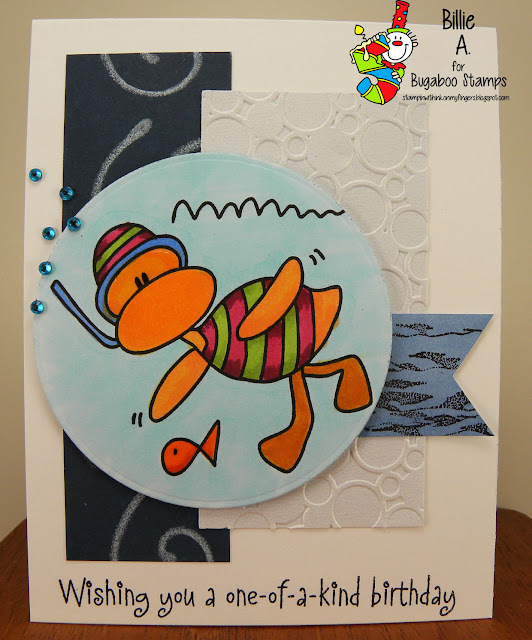 I stamped some grasses and a fish coming and going. I liked this true sentiment from Tech. Tuesday. 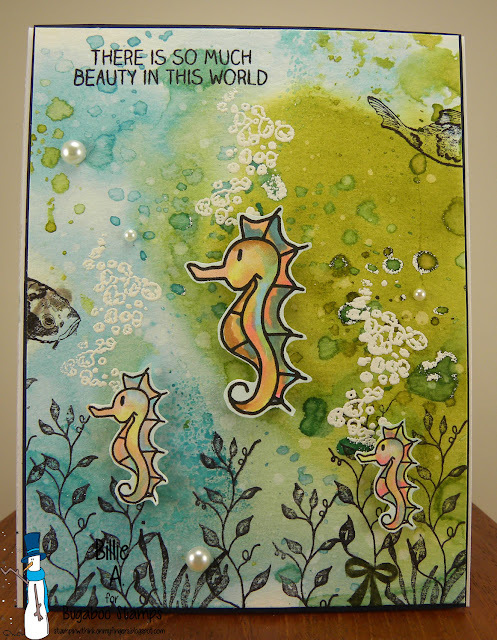 I added some fun pearls and embossed the bubble stamp and went over the body of the seahorses with Spectrum Noir glitter brush..